Anti-Vaxxer Co-worker is driving me nuts!!!!! Me: what happens if they don’t recover? 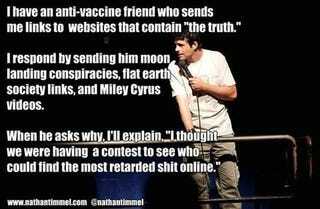 Him: well its the only way for them to develop their immune system. Also all sicknesses can be cured by natural honey, vinegar and essential oils. I used to just find some topic to change the subject before my head exploded, but now he brings it up every day.